Opinion Bureau claims to be a platform where you can earn by being an influencer and help companies offer better products and services. But is Opinion Bureau a scam or is it really a legit way to earn some extra cash online? Well, let me just reveal right away that it is legit in the sense that you can potentially earn a bit of extra money there. But this does not mean it will necessarily be worth your time and there are some things you need to take into consideration before joining. This Opinion Bureau review will give you all the details and give you an inside look so you can see and judge for yourself and easily find out if it is the right site to join for you or not. What is Opinion Bureau and what does the site offer? Opinion Bureau is, first of all, a paid survey site where you can get paid to share your opinions on various topics. This is why they call it an influencer platform – because you actually can have your opinion heard. It is owned and run by Internet Research Bureau Pvt. 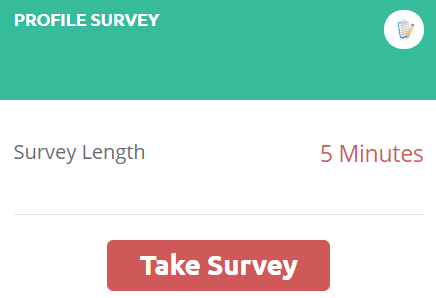 Ltd.
As already explained, it is a legit survey site, but this does not necessarily mean it will be worth your time. So let’s take a look at what you get access to as a member so you can see for yourself if it will be worth it or not. The main way to earn on Opinion Bureau is by taking paid surveys. Once you have joined, you have to take an initial survey profiler to be able to get access to other surveys. It says this profiler will only take 5 minutes. You have to take a profile to become a member. I have taken it myself, and it takes at least 5 minutes – I think it took me around 8 minutes. Not really a problem but you just need to be aware of this. Also, you will not get paid for this profile survey but you have to complete it to get access to other surveys on Opinion Bureau. Be aware that when you finish this profiler, you have to give your address. They also ask for your phone number. You can move forward without giving your phone number but you have to give your address. After this, you will get access to your dashboard. In most cases, there will likely not be any available surveys there as most of them are sent to you via email. In my experience, the number of paid surveys you get on Opinion Bureau is, however, not impressive. I have also seen several other reviews of Opinion Bureau from other users that say they have very limited surveys available. I think some of the reviews I have seen might be a bit harsh because it is possible to find a survey once in a while on Opinion Bureau. But it is definitely not one of the survey sites with the most opportunities. But you can find some extra surveys here and as an extra site, it can be worth considering. You should, however, make sure to also join some of the top paying survey sites as well, to get enough opportunities as Opinion Bureau alone will not give you many. Another option Opinion Bureau offers is to take quick polls. I usually like this option when survey sites offer it because they usually only take a few seconds to participate in and can be fun. On Opinion Bureau I was, however, once again not impressed with the opportunities. When you first come to the website it looks like a great option. And after logging in I then saw I had to click a link to see the available polls. You can supposedly take polls on Opinion Bureau. So I clicked this but all I got was then a screen saying that there were no live polls available. I did not find any polls – it might, however, just be because of my location. That can, of course, happen but to get an idea of how often they have these polls I then clicked to see the closed polls. Also here there were none. So does not really seem like a big opportunity. However, this might very well be different from country to country. So you might have more polls available in your country. But overall, it is definitely not a way to earn big money on Opinion Bureau. Like many other paid survey sites, Opinion Bureau offers you a small reward for inviting friends to join the platform. If you invite someone who joins and becomes an active member (means they have to complete at least one survey), you will get a small reward. However, that reward is really low on Opinion Bureau compared to on many other sites. It is only around $0.15 you will get. So even if you know a lot of people that might be interested in joining, it is not a way to earn a lot of money. Just think about it – you would have to invite 10 people that would all join, take the initial survey profile + complete at least one survey to earn just $1.5. For most people, inviting just 10 people that end up becoming active will take quite some time. So it is a way to earn a bit extra, but definitely not a lot you can earn that way on Opinion Bureau. Now you know a bit more about how you can earn on Opinion Bureau. But you also need to know how you can then get your earnings out. The methods are actually pretty good. You can, for example, get paid through PayPal, get Amazon gift cards, and more. Opinion Bureau has some good payout methods. 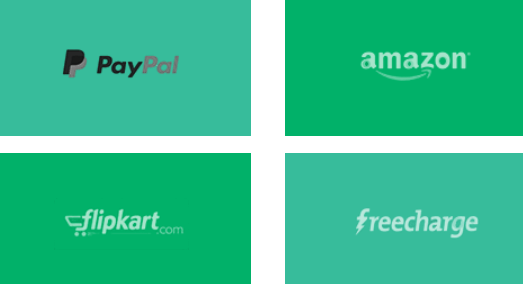 The exact payout methods can, however, vary from country to country, but as far as I am aware, you can get paid through PayPal in all countries, which makes it easy to get your earnings in cash. The payout threshold is only around $5 (can vary from country to country) so that is a nice low threshold. The thing you, however, have to be aware when it comes to getting paid on Opinion Bureau is that after a survey closes, it will take 45 days before the reward is initiated and it will then take another 7 days before the money will be in your account. This means that it will take at least 52 days before you can see the earnings in your account. Opinion Bureau says it is to give time to manually ensure the quality of the answers and to emphasize more on the interest in taking the surveys than on the rewards. However, even though I understand their arguments, I think this timeline is unreasonable. Especially when you compare it to the fastest paying survey sites, where some of them pay you in a matter of minutes after finishing a survey. 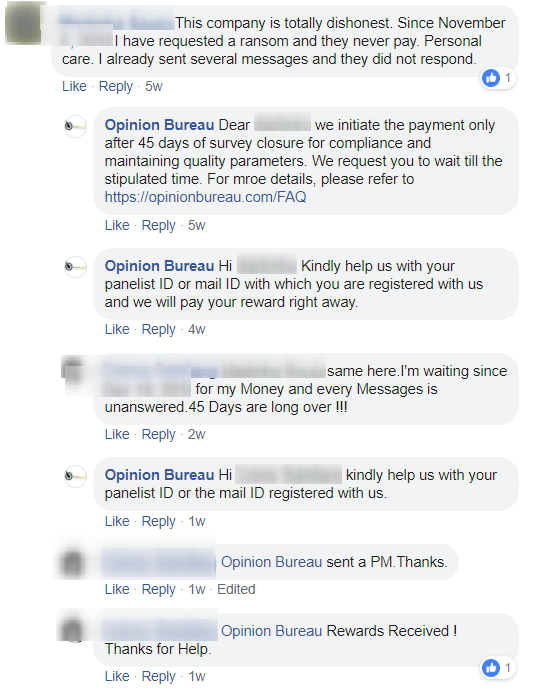 So the payout methods on Opinion Bureau are definitely good, but you just have to be a bit patient to actually get the money out. Overall, the earning opportunities on Opinion Bureau are quite limited. It is a legit site, so you can earn a bit extra by taking surveys here. But from what I have seen myself and from research about what others are saying as well, you should not expect too much. I would say that it might be worth joining as an extra site, but you should definitely make sure to also join other survey sites as Opinion Bureau alone will give too few opportunities. Yes, you definitely can use Opinion Bureau on mobile. In fact, it has an app that makes it very easy to use on mobile. The Opinion Bureau app makes it easy to use on the go. 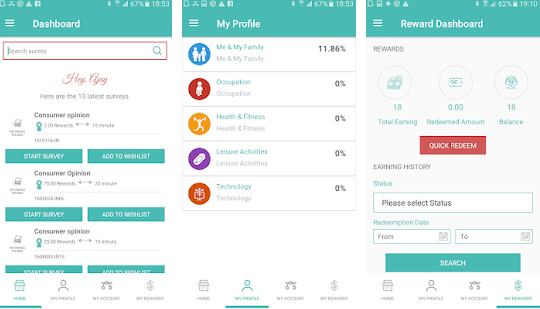 When survey sites are easy to use on mobile it is a big plus, in my opinion, as it is then possible to get easy access wherever you are and it makes it easy to earn on the go. Just be aware that the Opinion Bureau app will not give you extra surveys. The amount of opportunities will be the same whether you use the app or not. Who can join Opinion Bureau? Opinion Bureau is limited to certain countries. At the moment of writing this review, it is available in 16 countries. The countries you can join from. The exact amount of opportunities can vary from country to country. 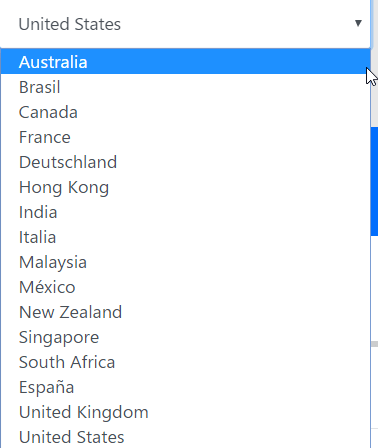 If you do not live in one of the countries you can see on the image above, you can instead check out the best survey sites in your country here. In fact, it is a good idea to check out the above link even if Opinion Bureau is available in your country as there are many sites with more earning opportunities. Being able to get support is important on any survey site. On Opinion Bureau you can submit a support ticket if you need help but it does not say how long it will take for you to get an answer. To get an idea about how responsive their support is, I took a closer look at how quickly they respond on messages on Facebook as this can give a good indication about how much a survey site cares about its members. I, for example, found this correspondence between Opinion Bureau and a couple of members. The support is fast at responding on Facebook. As you can see, in this case, Opinion Bureau’s support quickly resolves the issues and makes sure the member is getting paid. So great to see how responsive they are here. Of course, it is a bit concerning to see that the reason the first person posted on their Facebook wall in the first place was because she did not receive any response when contacting support. So from what I can see, you can get support but at times it might take some patience. Also, if you do not hear anything, it might be worth writing again or posting on their Facebook wall. So just to make it clear – Opinion Bureau is a legit site that pays you to take surveys and it offers legit payout methods. But this does not mean it is worth it. So let’s finish by summing up the pros and cons so you can get a better overview before deciding to join or not. 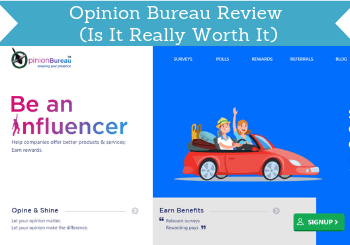 Overall, I would say that Opinion Bureau might be worth considering as an extra site as it has a low payout threshold and some good rewards options. So if you want to join as many survey sites as possible, then why not join it as a way to get access to some extra surveys once in a while. But you should definitely also make sure to join some of the top paying survey sites in your country and not solely rely on Opinion Bureau. That would give too few opportunities and take too much patience to get paid because of the long waiting period they have. How to join Opinion Bureau? It is very easy to join Opinion Bureau. Just click the button below, choose your country, and then you will be taken to a sign-up form that takes 1 minute to fill out. Remember that after signing up you have to complete the initial profile survey to get access to further surveys. If you have any comments, questions, or have any experiences with Opinion Bureau yourself, I would love to hear from you in a comment below. 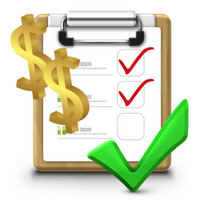 Opinion Bureau is a legit survey site with good payout methods and a low payout threshold. The earning opportunities are, however, limited due to the low number of available surveys. And the wait to get your earnings approved for a payout is very long compared to other survey sites. But if you can live with this, it is very easy to use and can be a good extra survey site to join.